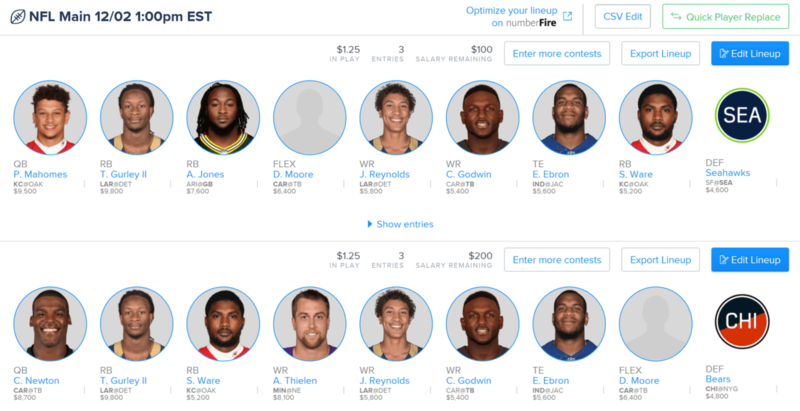 We were 11 for 15 in cash lineups over the last 3 weeks, and we’re back for more cash in Week 13! Let’s get to winning you some CASH in Week 13 of the 2018 NFL season! And don’t forget to check out this week’s Podcast where Ryan, Joey and I discuss some of our DFS thoughts at the end of the episode! So, without further to do, here are my suggestions for the Best Daily Fantasy Football Plays for Cash Games for Week 13 contests, along with they’re prices on Fan Duel (“FD”), Draft Kings (“DK”) and Yahoo! Daily Fantasy (“Y!”). The Kansas City Chiefs and the Oakland Raiders have the highest over/under of the weekend (55.5). Clearly the Raiders are a disaster, so let’s look at the Chiefs side. Oakland has the 4th worst defense in the NFL per DVOA, and the Chiefs happen to have the best overall offense in the NFL per DVOA. So let the good times roll. I’m in on Patrick Mahomes, Tyreek Hill, Travis Kelce and, now that Kareem Hunt has been released from the team due to his domestic violence incident, Spencer Ware as well. In fact, I think Ware is the value play of the week. I even like the Chiefs Defense if you want to save a couple bucks. The LA Rams and the Detroit Lions have the second highest over/under of the weekend (55), and they have a similar narrative to the Chiefs/Raiders game. The Lions have the 3rd worst defense in the NFL per DVOA, and the Rams have the 2nd best overall offense in the NFL per DVOA. So fire up all your Rams! I’m in on Jared Goff, Todd Gurley, Robert Woods, Brandin Cooks and Josh Reynolds. Of that group, I like Gurley the most, but really like the value you get with Reynolds. The Carolina Panthers and the Tampa Bay Buccaneers have the 3rd highest over/under of the weekend (54.5). Here, both defenses have been less than stellar, with the Panthers at 26th and the Bucs at 31st. So I’m in on both offenses here. On the Panthers side, I love using Cam Newton and Christian McCaffrey, and have no issues with getting some salary relief from D.J. Moore. On the Bucs side, with Desean Jackson out, I prefer to grab value with Adam Humphries and Chris Godwin, but don’t mind paying up for Mike Evans if you have the extra cap space. At WR, I really like Adam Thielen and Stefon Diggs [UPDATE: Diggs has some swelling in his knee, so I’m staying away as he’s a GTD] in an important game against a Patriots defense that’s 19th against the pass and Julian Edelman against a sturdy Vikings defense where Xavier Rhodes (if he plays) will likely shadow Josh Gordon. At RB, I also like Aaron Jones, who’s had a coming out party of late and is now facing a Cardinals defense that is 21st against the run. I really like the Chicago Bears defense against the New York Giants. The Bears have the top overall defense in the NFL and face a Giants team that allows the 3rd most sacks in the NFL (38). The Tennessee Titans defense hasn’t been great since managing to handle the Patriots, but have a much easier job this weekend against the New York Jets. And the Seattle Seahawks defense have decent matchup against the 49ers. 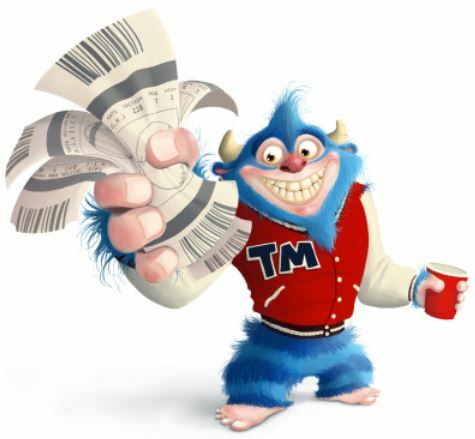 Feel free to throw them into the mix and take the one that fits your budget. With Devin Funchess on a strict pitch count, Curtis Samuel is also usable as a WR punt. 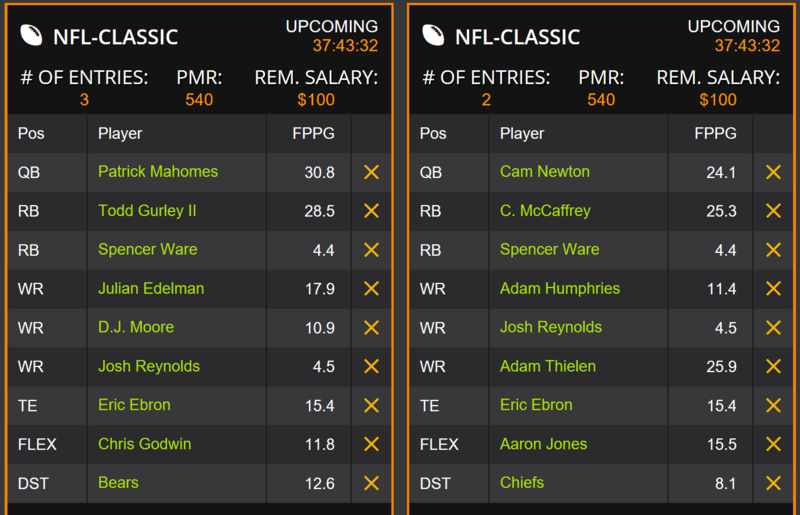 Good luck everyone, and I hope you all win DFS Cash in Week 13!